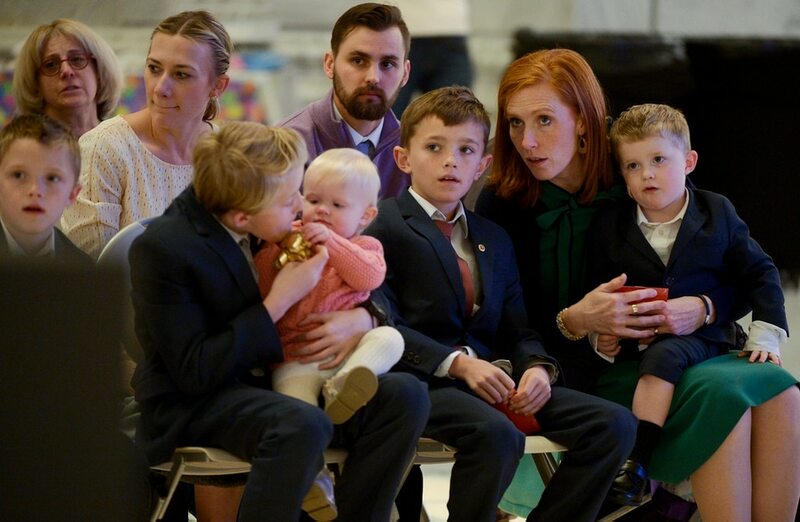 Leah Hogsten | The Salt Lake Tribune Jennie Taylor and her seven children participate in Chabad Lubavitch of Utah's 12th annual Hanukkah celebration at the Utah Capitol, Dec. 2, 2018. This year's event was also dedicated as 'A Salute to a Hero', in tribute to the late Maj. Brent Taylor of North Ogden, as the Menorah was kindled by his wife, Jennie Taylor. Leah Hogsten | The Salt Lake Tribune The Menorah is lit at Chabad Lubavitch of Utah's 12th annual Hanukkah celebration at the Utah Capitol, Dec. 2, 2018. 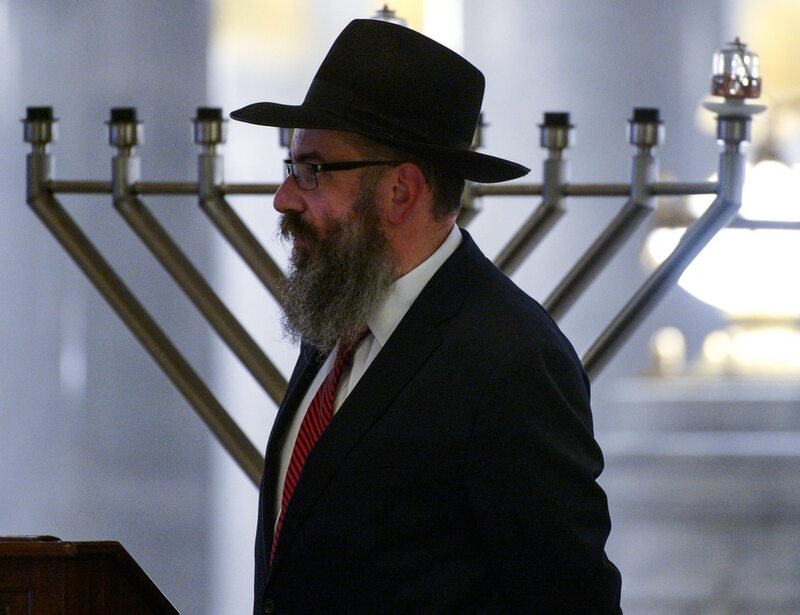 Leah Hogsten | The Salt Lake Tribune Rabbi Benny Zippel with Chabad Lubavitch of Utah was emcee of the 12th annual Hanukkah celebration at the Utah Capitol, Dec. 2, 2018. 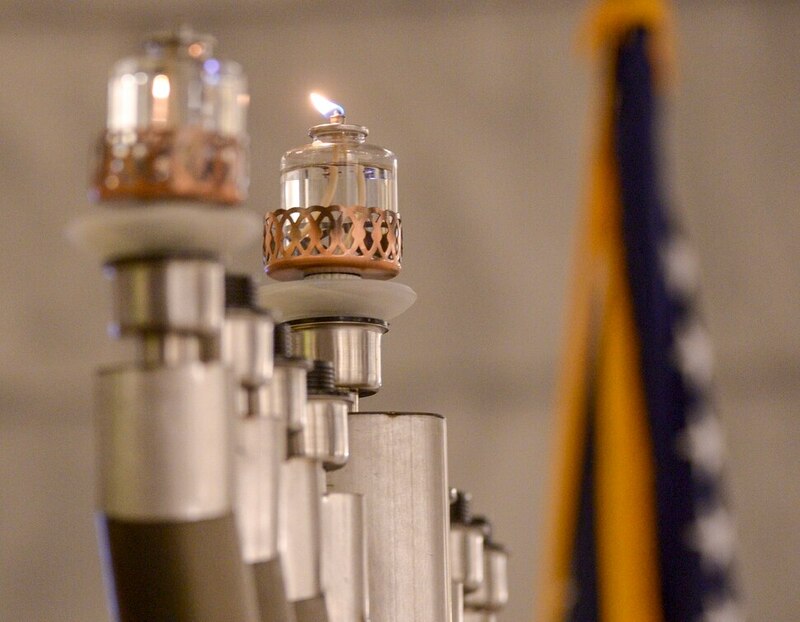 The event was also dedicated as 'A Salute to a Hero', in tribute to the late Maj. Brent Taylor of North Ogden, as the Menorah was kindled by his wife, Jennie Taylor. Leah Hogsten | The Salt Lake Tribune Rabbi Avremi Zippel with Chabad Lubavitch of Utah relights the first candle of the menorah during the 12th annual Hanukkah celebration at the Utah Capitol, Dec. 2, 2018. This year's event was also dedicated as 'A Salute to a Hero', in tribute to the late Maj. Brent Taylor of North Ogden, as the menorah was kindled by his wife, Jennie Taylor. Leah Hogsten | The Salt Lake Tribune Rep. Patrice Arent, D-Millcreek, talks about the meaning of The Festival of Lights at Chabad Lubavitch of Utah's 12th annual Hanukkah celebration at the Utah Capitol, Dec. 2, 2018. Leah Hogsten | The Salt Lake Tribune l-r Rabbi Benny Zippel with Chabad Lubavitch of Utah is joined by Jennie Taylor and her seven children as he lights the Menorah during the 12th annual Hanukkah celebration at the Utah Capitol on Dec. 2, 2018. The event was also dedicated as 'A Salute to a Hero', in tribute to the late Maj. Brent Taylor of North Ogden, as the Menorah was kindled by his wife, Jennie Taylor. Leah Hogsten | The Salt Lake Tribune Patrice Arent, D-Millcreek, right, speaks with Jennie Taylor during Chabad Lubavitch of Utah's 12th annual Hanukkah celebration at the Utah Capitol, Dec. 2, 2018. This year's event was also dedicated as 'A Salute to a Hero', in tribute to the late Maj. Brent Taylor of North Ogden, as the menorah was kindled by his wife, Jennie Taylor. Leah Hogsten | The Salt Lake Tribune Jennie Taylor tends to one of her sons as her children dance under the Menorah during the 12th annual Hanukkah celebration at the Utah Capitol, Dec. 2, 2018. The event was also dedicated as 'A Salute to a Hero', in tribute to her late husband, Maj. Brent Taylor of North Ogden. For the 12th year, the beginning of Hanukkah was marked by the lighting of a giant menorah at the Utah Capitol on Sunday evening at sunset. The eight-day Jewish holiday, also known as the Festival of Lights, commemorates the historic victory of the Hebrew Maccabees over the Syrian Greek army, and the subsequent miracle of an oil lamp that remained lit for eight days in Jerusalem’s holy temple. Jennie Taylor — the widow of Utah National Guard Maj. Brent Taylor, the former North Ogden mayor who was killed during a deployment to Afghanistan — attended the event at the Capitol. Sunday’s and other public menorah lightings were arranged under the auspices of Rabbi Benny Zippel, executive director of Chabad Lubavitch of Utah. Zippel has been a presence since 1993 in the Beehive State, where he has worked tirelessly to increase visibility of the Jewish community and traditions. He also has been a regular participant in the state’s wide-ranging interfaith network, making friends with leaders of various religious traditions — including the late LDS Church President Gordon B. Hinckley. After Hinckley died in 2008, his son gave the rabbi a menorah his father had received years earlier as a gift from an Israeli government official. The leader of The Church of Jesus Christ of Latter-day Saints wanted his friend, the rabbi, to have it.